Google Analytics is a great tool to present statistics on your websites performance. The information is presented well and enables you to dig into quite a bit of detail on where your visitors came from and what they do on your website. There are several stages to setting up a Google Analytics account which are described in the following sections. It's quite a simple form. If you have your own email address and it's not a gmail one, then I recommend you select "I prefer to use my current email address". Don't forget to note down the email address and password you used! Stick to tracking a "Website"
After you submit the form and accept the terms you will be sent to the Tracking Code page. Make a copy of the Tracking ID and the Tracking Code as you will need one of them later. If you already have an analytics account, you can add extra websites to it (via Properties). For website developers I recommend creating a new Account per client. This way the client can take the account with them if they change developers. You should now have an Account, a Property for your Website and some Tracking Code. You're almost there! In order for analytics to work, you need to place the tracking code in every page of your website. If you are using WordPress then there are several plugins that can make the code insertion easy. I currently recommend Google Analytics by Yoast which not only inserts the code for you but also gives you easy access to switch on some advanced tracking concepts. If you have a website developer they should know what to do with it. Many website designs use a common file to define the head section of all the pages in a website. If so you can use this to quickly add the code to every page. After adding the code, make sure it is not visible on the page. This may happen if you are using a WYSISYG Html editor. You will need to switch to a plain html mode to add the code. This code will then talk to Google Analytics every time someone visits a page, and that's how it all works. 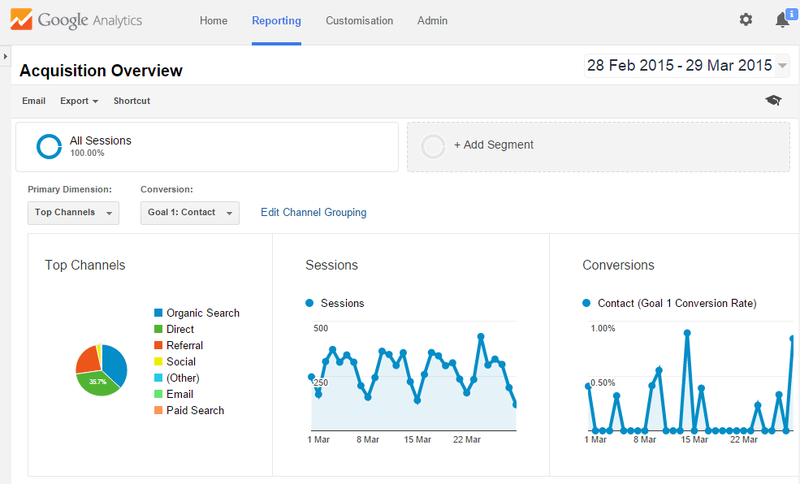 All of the default charts and tables are under the Reporting tab which you can find at the top left of the Google Analytics account. The left panel shows groups of reports which you can expand to see the reports available. There are a lot! Audience->Overview:This is what most people are first interested in. How many people are visiting my website. The higher the better of course! If you hover over the titles of the mini graphs you will see an explanation on what they mean. Acquisition->Overview: This shows you how people are finding your website. Organic Search means from the search engines while Referral is from another website. Direct means there is no info which normally means something like a private bookmark or an email. Behaviour->Overview: This is where you can see what people have got up to on your website. Which pages area popular and which cause people to run away (bounce). This is just the start. Analytics is a very powerful tool with many reports and ways to dig deeper into them. Check out my other articles in the Google Analytics section to help you get more out of it.